The first-line treatment for TN is Medical or Pharmacologic. Carbamazepine is considered the most proven, first-line treatment for TN( Trigeminal Neuralgia), and it’s been shown to be effective in treating the condition. Carbamazepine should be offered as the initial treatment for patients with TN. Oxcarbazepine has also been shown to be effective for treating patients with TN. Doctors usually prescribe carbamazepine (Tegretol, Carbatrol, others) for trigeminal neuralgia. Other anticonvulsant drugs that may be used to treat trigeminal neuralgia include oxcarbazepine (Trileptal). Gabapentin and Pregabalin as an add-on agent for patients already taking carbamazepine or oxcarbazepine. The main problem with treating TN patients with AEDs, even if they are tolerated initially, is that the treatment does not address the vascular compression cause present in 95% of patients, nor the fact that TN is a progressive syndrome. Therefore the usual result is that, over time, patients require a higher and higher medication dose to achieve the same degree of pain relief, until a point is reached, at which either the medication no longer controls the syndrome or the patient can no longer tolerate the medication side effects. Surgical interventions are divided into Nonablative (nondestructive) procedures and Ablative (destructive). Posterior Fossa Exploration: Microvascular Decompression and Partial Sensory Rhizotomy Exploration of the trigeminal root in the posterior fossa is a major operation with a 0.2–0.5% risk for mortality and major morbidity. By a retrosigmoid posterior fossa approach, in which a blood vessel in contact with the trigeminal nerve is dissected free and prevented from re-impinging on the nerve by placing a Teflon pad between the two structures or by transposing the vessel to a different position. Radiofrequency rhizotomy is based on temperature-dependent selective destruction of pain-transmitting C fibers whiles sparing the A-delta fibers. We recommend RFTC for most patients undergoing their first surgical treatment for typical Trigeminal Neuralgia, TN in multiple sclerosis and patients who have failed Microvascular Decompression. This is a day care procedure. Preoperative workup involves evaluation for fitness to undergo short general anesthesia. The patient has explained the procedure in detail and what to expect during the procedure so as to ensure adequate cooperation. 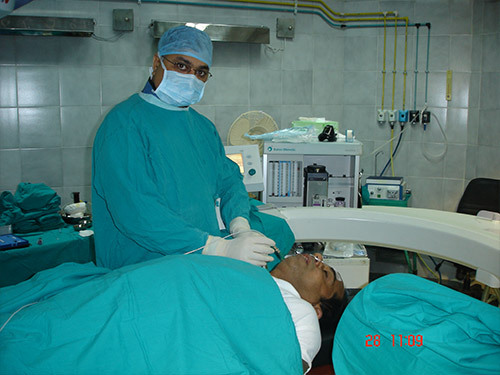 The procedure involves retrogasserian needle placement by the percutaneous technique. The needle is introduced through a point 2.5 cm lateral to the angle of the mouth on side of the lesion. It is passed medial to the mandible and aimed in the direction of the petrous bone and clivus junction, seen on lateral fluoroscopic view. The medial part of the foramen ovale is entered. Oblique view localizing the foramen is useful in case of difficult penetration. Once the needle is in position, the appropriate trigeminal division is stimulated using the current from the radiofrequency lesion generator. The patient typically experiences paraesthesia in the territory of his pain. In case he does not feel the paraesthesia in the desired territory, the needle position is adjusted. Once the distribution of the paraesthesia is confirmed a short general anesthetic (IV propofol) is administered and the division is lesioned using 70oC current for 60 sec. The patient is woken up while the needle is still in place. He is asked to check if he has got adequate pain relief. This procedure is suitable for the second and third division TN. For the first division TN supraorbital block and if successfully followed by supraorbital neurectomy. Results of RFTC : We have been performing RFTC for last 15 years .we have compared our results with those published in the literature( Table 2). In this procedure, the trigeminal nerve is compressed with a small balloon to induce ischemic damage on the rootlets and ganglion cells. 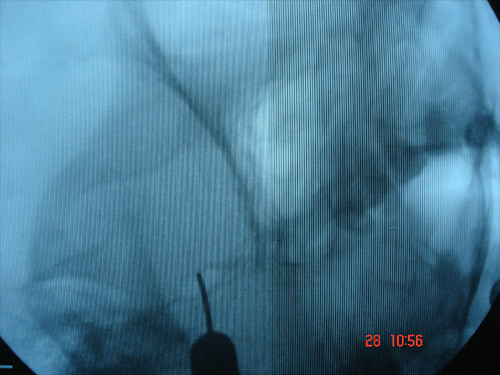 Once the entry has been gained to the Gasserian ganglion, a Fogarty embolectomy catheter is inserted through the needle and inflated with nonionic, water-soluble contrast dye until the balloon becomespear shaped. The length of time for inflation varies. Despite insufficient quality data on this technique, the results appear to be comparable to those after RFT. However, transient masseter weakness affects virtually all patients treated with this technique, and vascular injury and aseptic meningitis appear to be more common than with other ablative techniques. Glycerol is a mild neurotoxic substance that has a slow, nonselective neurolytic effect as it diffuses around the surface of the nerve. Recurrence rates following glycerol rhizotomy are the highest of all the ablative techniques. SRS delivers a high dose of radiation, usually 70–90 Gy, to a small area (isocenter) of the cisternal portion of the trigeminal nerve. The procedure is carried out under local anesthesia with light intravenous sedation and is typically conducted on an outpatient basis. Same-day MRI is performed to provide accurate stereotactic information about the location of the trigeminal nerve. This surgery targets the dorsal root entry zone (DREZ) of the trigeminal nucleus caudalis in the brainstem. It is performed with a radiofrequency electrode producing coagulation along the posterolateral sulcus along the dorsal root entry zone, in the posterior aspect of the craniocervical junction. The objective of the lesion is to interfere with the transmission of pain stimulus through the secondary neurons in this region. When this pain pathway is blocked with the DREZ procedure, the pain signal cannot reach the brain and decreases the processing of pain. Neuromodulation is a promising therapeutic strategy for the treatment of neuropathic facial pain disorders. Leads are placed in the nerve distribution with connections to a pulse generator in the subclavicular fossa. PNS for trigeminal neuralgia includes neurostimulation of the supraorbital and infraorbital nerves which is Transcutaneous Supraorbital Neurostimulation, Infraorbital Nerve Stimulation, and Supratrochlear Nerve Stimulation. It is similar to PNS, except electrodes are placed in the area of pain rather than on the nerve itself. The even less invasive transcutaneous electrical nerve stimulation (TENS).The TENS unit is external electrodes on pads, electrodes are placed just before the ear, the other in the region of the affected nerve branch. 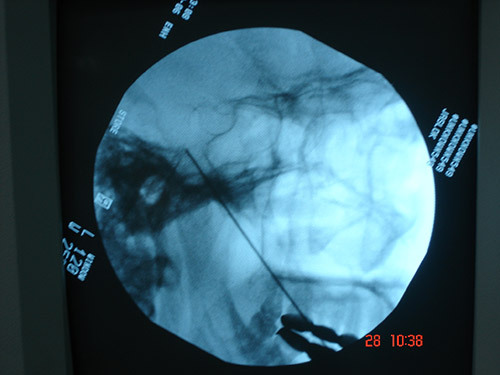 Gasserian Ganglion Stimulation: Patients with pain secondary to the damaged nerve or ganglion as occurs after some poorly performed surgery for trigeminal neuralgia or in cases of nerve infiltration by tumors, experience burning or nagging pain in the distribution of the trigeminal nerve. This is known as trigeminal neuropathy. Neuromodulation by the way of gasserian ganglion stimulation or motor cortex stimulation is the only sensible alternative for treating this pain if the medical treatment fails. This involves implantation of the electrode at the target site and delivering current to the target nerve or cortex through a pacemaker.It is presumed that this will either increase their pain threshold or block the painful impulses from the periphery to relieve pain. 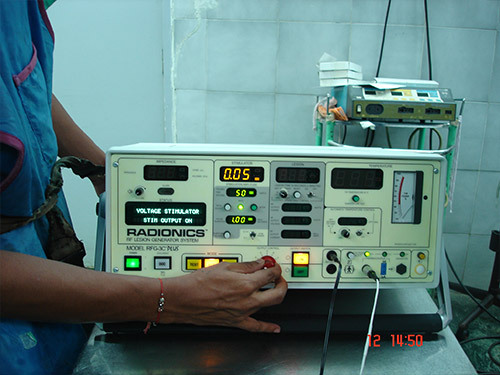 This is a highly advanced form of treatment available at only select centres like Jaslok Hospital.